The USHA 1-Wall Small Ball Junior Nationals Is Back! 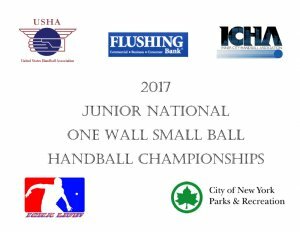 New York, NY, WPH Press, 4/18/17- The United States Handball Association is proud to sanction the USHA 1-Wall Small Ball Junior Nationals June 10-11, 2017 at Coney Island’s world famous 1-Wall handball courts next to the New York Aquarium. The World Players of Handball is thrilled to join the USHA, ICHA, Flushing Bank, Glenn and Kristina Hall, and Jared Vale in sponsoring the event and providing opportunities for youngsters from across North America to compete against one another in one of the most fun junior handball events in the country. Log onto wphlive.tv, Like the World Players of Handball on Facebook, or follow the WPH on Twitter @dfwph and @wphlive for all of the handball news from on and off the court! For more information on junior handball, please visit juniorhandball.org or contact WPH Development Director David Fink at fink@race4eight.com. The World Players of Handball is a non-profit foundation aiming to grow the game of handball through innovation and inspiring the next generation of players through junior clinics with certified WPH coaches, junior tournaments and the Race 4 Eight tour.